Christian orthodoxy and neoliberal economics exist in tension. Some theologians identify ruptures rather than continuities between the theopolitics of the patristic and middle ages and the rise of capitalism in the early modern era. The Anglican theologian John Milbank was instrumental in correlating “orthodoxy” not with conservative but a “radical” politics, first advocating for socialism and more recently for a “civil economy” (see The Politics of Virtue). Similarly, William Cavanaugh couples Naomi Klein’s critique of capitalism with a positive materialism drawn from the Eucharist (see Being Consumed). Dan Bell draws on Deleuze’s critique of capitalist desire and turns to Christology for a counter-discipline of desire (See Liberation Theology after the End of History). Kelly Johnson retrieves Peter Maurin’s “viator economics” to address poverty. What these and other attempts at a theological economics share in common is that Christianity does not need to revise its core mysteries – Trinity, incarnation, the church as Christ’s body, the Eucharist – to challenge neoliberalism and the dominant forms of life a capitalist order fosters. Instead, more attention to those mysteries will disclose the vapidity, immorality, and indecency of a capitalist order. Devin Singh finds this mistaken. 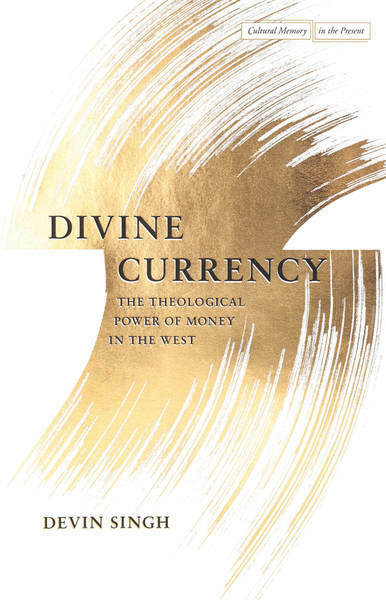 Divine Currency is an intriguing work in religious and cultural studies that challenges much of the work done in theology and economics suggesting that it failed to attend to how the two central mysteries of the Christian faith, the Trinity and incarnation, are implicated both in ancient and modern Western economic dominance. The genre of this work is archaeological, genealogical, and “re/constructive” situated in the Neo-Nietzschean trajectory of Foucault. His work builds on, and is deeply indebted to, Giorgio Agamben’s The Kingdom and the Glory, siding with Agamben for a “type of continuity” between late, antique Christianity and early modern theories of governmentality. Although Singh’s work is filled with intriguing historical insights, it is not a work of history. It is genealogy. Singh’s work is an alternative, not only to radical orthodox theologies but also to liberation theologies. There is no Jewish, Christian nor Marxist comfort to be found here. It fits squarely within the Nietzschean tradition in which joy arises only when we have fully confronted the despair produced by recognizing that everything sacred has died at our hands. His work not only implicates the Christian Right who have long embraced an Eusebian logic of sovereignty, governmentality, and monetary economy by merging it with Christianity but also all those forms of Christianity that seek to challenge it. (Although ironically, those who identify Christian orthodoxy with modern capitalism will find their identification vindicated). There seems to be no challenge to the distorting effects of capitalism available to theologians. There is only the flow of power through a theopolitical-economy, and we theologians cannot do much more than unmask it. Singh supplements Agamben’s The Kingdom and the Glory with an analysis of money, arguing that Agamben does not go far enough in interpreting the Trinity, especially the Father-Son relation, as the source not only for western governmentality but also colonialism and neoliberalism. The “Son” is God’s “coin” by which God becomes involved in “predatory lending.” The central theme is straightforward and repeated multiple times throughout the work, each time correlated with new insights about the implicating relations between the flows of the divine and monetary economy. That theme is this: “What emerges in Eusebian theology is an understanding of the Logos, the Son, as the economic administrator of the Father, given the reins of governance by the ruler of all.” Eusebian theology, however, is not a narrowly construed “Constantinian” theology; Eusebius is, for Singh, one of the important theologians of Christian orthodoxy. The heart of the argument is laid out in the first chapter and asks the reader to take on several assumptions for the argument to work. First, Eusebius of Caesarea is a theologian of Christian orthodoxy. Second, the use of the term oikonomia has a continuity when applied to household, city-state, God and modern market relations. The case for the relation between Christianity’s central teachings and modern market relations hinges on this “homological” use of the term “oikonomia.” Although each of Singh’s chapters develops a different Christian doctrine, or aspect thereof, what unites them together and warrants the comparison with early modern developments is their common logical deployment of “oikonomia.” Third, explicit antique moral and political opposition to the logic of capitalism is sidelined. For instance, Aristotle’s distinction between chremastics and oikonomia reflects an unwarranted “idealistic philosophical dichotomy” so that Aristotle’s critique of a monetary economy does not challenge the common use of oikonomia, a use the church fathers perpetuated. A similar argument works for prohibitions against usury. Even when Gregory of Nyssa opposes usury, his argument serves the interest of the predatory Divine Economist. Fourth, the theological architects of Christian teaching did more than incorporate “elite philosophical discourse,” they also took on a “central characteristic” of antique oikonomia – “the prudent and strategic use of financial resources for gain.” Finally, this conception of oikonomia “became determinative for terminologically precise debates about God’s relation to the world in incarnation and activity in redemption.” The next five chapters seek to make a case for these assumptions. The strength of Singh’s work is his historical attention to the use of economic metaphors in the development of Christian doctrine. The suggestive, provocative, and to this point unsubstantiated aspect of his work is the correlation between that use and the rise of early, modern economic arrangements. In saying this I am restating what Singh himself noted in his conclusion: “While I am convinced of the significant impact of monetary economic ideas and institutions upon early theological formulations, as well as the resultant legitimation that theological language could then provide to pastoral and political practice, further historical work is needed to demonstrate how such processes actually played out.” His work is a call for that historical work to be done as a next step. If it is done, his work will be convincing. Then it will be difficult, if not impossible, to be a Christian theologian that affirms its central mysteries and rejects capitalism. If no such historical work follows, then Divine Currency will remain within the orbit of the Neo-Nietzschean genealogical task of unmasking. I admit that I find the connections between fourth-century doctrine and the modern economic order the weakest aspect in the book. One would be hard pressed to find any explicit connection between these doctrines and the political economy of Hume, James Stuart, Adam Smith, the Mills, Ricardo or the Austrians. In fact, the reverse is true. One can find explicit and implicit rejections of those teaching. Alfred Marshall studied theology, and perhaps his work would be a promising source for the connections Singh’s work needs to be persuasive, but few economists give specific Christian teaching any attention. Adam Smith affirmed a divine providential order, but those who see in it nothing but a more cautious approach to religion than that of his friend Hume make, to my mind, a compelling case. For the Austrians in particular, the world is meaningless until our will gives it value. Theology is what was discarded in the “creative destruction” that generates value. Rather than fitting with this dominant, modern idea, theology should stand in opposition to it. Perhaps asking for this kind of explicit historical connection between fourth-century Christian teaching and eighteenth-century economic philosophers does little to challenge Singh’s work. It is genealogical. He does make an argument for how divine currency mediated through Christian teaching could be readily used for an exploitative economic order. There is no pure doctrine, no pure church, no theology that cannot be used for nefarious ends. Because we have examples that it has, in fact, been so used, Singh’s work should be taken as a cautionary tale. Yet to cite a scholastic axiom, abusus non tollit usum (the abuse of a thing does not take away from its usefulness). Divine Currency does not convince me to abandon theology. Singh does not think that I should, although he and I may disagree about what theology is. His work could confirm secular readers that they are correct about the dangers the study of theology brings to the twenty-first-century university. It offers support to colonialism and exploitation. I do not think calling for the abandonment of theology is his intention, but if his correlation between basic Christian teaching and neoliberalism is correct, then it is unclear if theology could, or should, have any place in modern intellectual life other than as an object of critique. Stephen Long is Cary M. Maguire University Professor of Ethics at Southern Methodist University. He works in the intersection of theology and ethics and has published over fifty essays and fifteen books on theology and ethics including Divine Economy: Theology and the Market(Routledge, 2000), The Goodness of God: Theology, Church and Social Order (Brazos Press, 2001), Calculated Futures (Baylor, 2007), Christian Ethics: Very Short Introduction (Oxford, 2010), The Perfectly Simple Triune God: Aquinas and His Legacy (Fortress Press, 2016), and Augustinian and Ecclesial Christian Ethics: On Loving Enemies (Fortress Press, 2018).